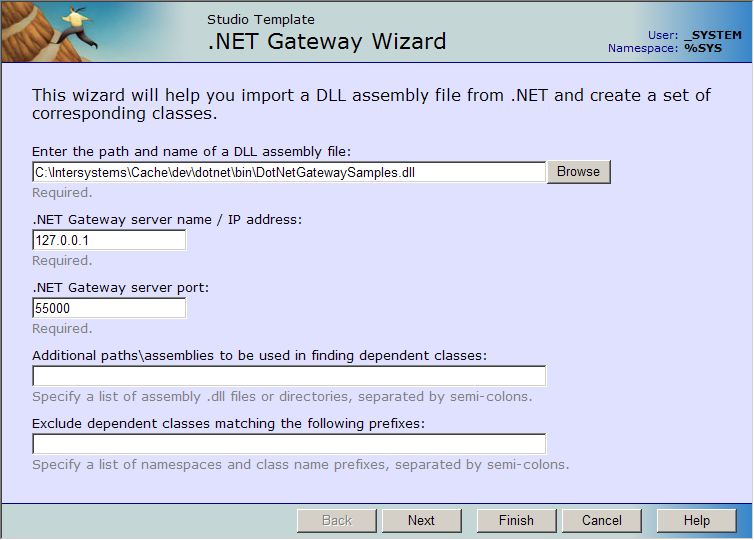 Using the Studio .NET Gateway Wizard  The simplest way to generate proxy classes for a .NET assembly is to use the .NET Gateway Wizard plugin supplied with Studio. Generating Proxy Classes Programmatically  You can also generate proxy classes from within an ObjectScript program. The %Net.Remote.Gateway class contains the methods used to import class definitions from .NET assemblies and generate Gateway proxy classes. See Using Wrapper Classes with .NET APIs for a description of the preferred method for importing third-party DLLs. See the Mapping Specification chapter for a detailed description of how .NET classes are mapped to Caché proxy classes. Start a .NET Gateway server. The server must be running before the Wizard can be used. .NET Gateway server name / IP address:  Required. IP address or name of the machine where the .NET Gateway server executable is located. The default is "127.0.0.1". %Import()  imports .NET classes or assemblies from the .NET side and generates all the necessary proxy classes for the Caché side. See the %Net.Remote.Gateway Caché class documentation for a complete listing of all Gateway methods. If it finds any .NET classes that are new or changed, or that have no proxy classes on the Caché side, the .NET Gateway worker thread generates new proxy classes for them. The %Import() method imports the given class and all its dependencies by creating and compiling all the necessary proxy classes. The %Import() method returns (in the ByRef argument imported) a list of generated Caché proxy classes. For details of how .NET class definitions are mapped to Caché proxy classes, see the Mapping Specification chapter in this guide. %Import() is a onetime, startup operation. It only needs to be called the first time you wish to generate the Caché proxy classes. It is necessary again only if you recompile your .NET code and wish to regenerate the proxies. While mapping a .NET class into an Caché proxy class and importing it into Caché, the .NET Gateway loops over all class dependencies discovered in the given .NET class, including all classes referenced as properties and in argument lists. In other words, the .NET Gateway collects a list of all class dependencies needed for a successful import of the given class, then walks that dependency list and generates all necessary proxy classes.